So, last week I was walking home in the rain on Aberdeen Avenue west of Queen Street South and got splashed by one of the cars that was roaring past me just inches from the sidewalk. In frustration, I pulled out my phone, took a photo and posted it to twitter. I had no idea that one tweet would snowball into a wide-ranging debate that spanned almost a week and accumulated at least several hundred total replies. The main reason it turned into a thing, I think, is that Ward 8 Councillor Terry Whitehead decided to join the discussion, mainly to caution against doing anything to Aberdeen that might, um, slow down traffic. As always, much as I might disagree with Councillor Whitehead on a given matter of policy, I have to acknowledge his willingness to engage publicly in the discussion. The debate itself is worth unpacking a bit because it really drives home the fact that the case for putting Aberdeen on a road diet is so robust. Lots of issues came up, including rat-running on Stanley and the case for converting Queen to two-way, but to keep this article from getting too unwieldy I'll focus on the Aberdeen/Beckett/Garth discussion. The section of Aberdeen Avenue between Queen Street and Highway 403, just west of Longwood Road, forms part of a shortcut route between the west mountain and west Hamilton. The City designates it as a "minor arterial" road according to this map in Appendix 11 to the Urban Hamilton Official Plan [PDF]. According to the City's Classification of City Streets [PDF], a minor arterial has a design speed of 70 km/h (!) and carries 5,000 - 20,000 vehicles a day. Aberdeen carries around 17,000 vehicles a day, a volume that falls in line with the definition. The guideline also states that a minor arterial should be 20-36 metres (66 to 118 feet) in right-of-way width. I don't have an exact width for Aberdeen, but it is certainly less than the default minimum of 20 metres wide, even including the narrow ribbons of sidewalk. I would estimate it is approximately 15 metres (50 feet) in width, including sidewalks. The Classification does not specify a number of lanes for a minor arterial, but note that one of the other nearby minor arterials on the map is Dundurn Street South, which is only one lane in each direction (with painted bike lanes). In terms of traffic calming, the Classification indicates "gateway features" where required. Gateway features are street design elements intended to communicate to drivers that they are moving into a new and different area when entering the street. Examples of gateway features can include bumpouts and neckdowns, planted islands, street trees, bollards, enhanced crosswalks, planters, and so on. Cycling should by default be accommodated through "wider lanes or separate facilities where required". Currently, this stretch of Aberdeen is four lanes, two in each direction, with a yellow centre line and the outer lanes immediately next to narrow sidewalks that line the two sides of the street. A broad consensus is emerging among transportation planners and traffic engineers that an arterial street can comfortably carry up to 20,000 vehicles a day on one lane in each direction with a centre turn lane. In fact, traffic often flows more smoothly - albeit with a significant reduction in dangerous speeding - when a four-lane street is converted to three lanes. Some places go even farther. The City of Chicago's complete streets policy [PDF] recommends one lane in each direction with a centre turn lane for streets up to 25,000 vehicles a day. It can still carry up to 20,000 cars a day at a reasonable level of service so congestion is avoided. With one lane in each direction, it is no longer possible for vehicles to pass at dangerously high speeds. The centre turn lane means through traffic is not stuck behind left-turning vehicles. Space is freed up for other uses, e.g. bike lanes or all-day curb parking. It becomes possible to provide a buffer of parking or space between vehicle traffic and pedestrian traffic. The number of potential conflict points is reduced. Combined with reduced speeding, that means fewer and less serious collisions. What is most astonishing is just how inexpensive it is to implement a road diet. In most cases, it can be done using just paint, signage and cheap bollards. Yet the return on investment is tremendous. According to the US Department of Transportation, road diets reduce crashes by 29 percent on average. A recent road diet cost-benefit analysis was undertaken for the city of New Brunswick, New Jersey on a four-lane arterial that carries a lot more traffic than Aberdeen - over 30,000 vehicles a day. They found that the proposed road diet would have only a small impact on vehicle delay - a few minutes a day - but taking a very conservative estimate of a 19 percent reduction in crashes, it would save up to $37 million in costs due to injuries and deaths over 20 years. The authors concluded, "Public officials should be less timid in their approach to implementing positive changes that improve safety and walkability, even at the expense of potential delays to traffic." As I mentioned, I don't know the exact width of the street but assumed a width of 13.5 metres (44 feet), not including sidewalks. Obviously the final design will depend on a number of factors, including the actual width and input from the various stakeholders. This is just a suggestion meant to indicate possibilities. But will this general principle work on Aberdeen? Councillor Whitehead doesn't think so. He insisted repeatedly that traffic calming on this street will "create congestion" and "chew up capacity that is needed". He also claimed that Beckett Drive is already congested and Garth Street is "jammed with traffic". It's hard to believe the police would be wasting their scarce resources trying to reduce dangerous speeding on a street that is too congested to speed on. Luckily, we have a source of real, live, local data we can use to get to the bottom of this. You may have noticed that Google Maps has a Live Traffic layer that superimposes green, yellow, light red or dark red lines on streets based on whether traffic is moving quickly or slowly. With the traffic layer enabled on your map, you can toggle between current live traffic and "typical traffic" for a given weekday and time. As you can see, aside from brief slowdowns at intersections to wait for traffic signals, there is no serious congestion on Garth, Beckett or Aberdeen even during rush hour. For the rest of the day, they function as race tracks that encourage dangerous speeding. For this reason, I think Garth should also be put on a road diet. If we reconfigure these streets so that their own design enforces safe vehicle speeds, we free up the police officers that we are currently throwing at the problem for more valuable work. Whitehead insists that the daily volume of traffic on these streets cannot fit on one lane in each direction, but we need to point out that it already fits on one lane in each direction: on Beckett Drive, which the city incidentally classifies as a major arterial. Beckett Drive carries 20,000 vehicles a day, signficantly more than Aberdeen (some of that traffic is going north on Queen and turning east on Herkimer). Obviously Beckett Drive has the advantage of no cross streets between Auchmar and Glenfern (turns are not allowed onto Amelia), but that's why the road diet includes a centre turn lane: so that through vehicles are not stuck behind left-turning vehicles. It's important to understand that almost all of the traffic on Aberdeen is cut-through traffic passing between the West Mountain and West Hamilton. A couple of years ago, when Beckett Drive was closed for reconstruction, the volume of traffic on Aberdeen collapsed to almost nothing. No exaggeration: literally several minutes would pass without a single car on the street. And no, I'm not saying we should close Beckett Drive. I'm pointing out that most of the traffic on Aberdeen is coming from Beckett, and Beckett is able to carry it all on just one lane in each direction - even during rush hour. Whitehead refused to accept that we can implement a road diet on Aberdeen without causing congestion, despite all the evidence to the contrary. Instead, he advocated "Education, enforcement, stiffer penalties, [and] reducing speed limits" to deal with dangerous speeding. I'm not sure what he means by education, but we're already doing enforcement and it's not working. Stiffer penalties for speeding would be up to the Province to implement, and reducing speed limits has been proven not to change driver behaviour unless it is accompanied with changes to the street design. The problem with enforcement is that it only works - to the extent that it works at all - while the enforcement is actually happening, so it is an extremely expensive way to reduce speeding. Even then, it works by waiting for people to drive dangerously and then punishing them. Presented with this, Whitehead countered that he advocates photo radar, pointing out that it is being used by the City of Edmonton. He claims photo radar is "a deterrent for speed and generates revenue", but I don't see how both of those claims can be true. If photo radar really is working as a deterrent, that means people are not speeding, in which case the system shouldn't be able to generate revenue. Conversely, if the system is generating revenue, that means people are speeding, which means it is not succeeding as a deterrent. Whitehead claimed that the photo radar setup changes driver behaviour at a given location, and then can be moved to another location to start changing driver behaviour there. I'm not so sure about that: driver behaviour is highly context specific, and as soon as people figure out the radar system has been moved they will resume driving in a way that feels natural for the street. Incidentally, I have no problem with photo radar, especially if the revenues are dedicated for road safety improvements. Hamilton already has a red light camera system, the revenue from which is being used to fund a strategic road safety program. However, merely waiting for people to break the law and then punishing them will always be a worse solution than redesigning the street so that people are discouraged by design from breaking the law in the first place. A well-configured inclusive street is self-enforcing by design, deterring dangerous behaviour all the time - whether or not the threat of punishment is in place. Enforcement is at best a stopgap while waiting for necessary redesign. I must also point out that Edmonton's use of photo radar is only one part of a comprehensive strategy framed by the city's adoption of the Vision Zero goal of eliminating traffic fatalities - the first Canadian city to do so. This approach does not ignore risk taking behaviour, but acknowledges human fallibility and the need for greater allowances for human error. Planning and developing a safe system means looking beyond standards and towards systematically planning and designing a sustainable and inherently safe road and transportation system for all road users. This is exactly what we have been saying for years about our need to move from train-and-blame to engineering-for-safety. Finally, after spending a week arguing strenuously against traffic calming on Aberdeen, Whitehead claimed he "will not prejudge the outcome" of the City's Transportation Master Plan review, which is currently underway. This became the mantra of his replies: "I willing to wait for the recommendations coming out of the study", "let the study unfold", and so on. Of course, this the same Councillor who already prejudged the Transportation Master Plan review earlier this year by denigrating lower-city residents who got engaged in the consultation process, implying that they are unemployed or don't have families and are trying to "hijack" the process. The deeper problem is that Hamilton has approved a number of master plans over the past 15 years, but then mostly fails to put those plans into action. When it comes budget time, year after year goes by without streets being converted back to two-way or crosswalks being installed. In Wards 1 and 2, the only significant street improvements have come about via the participatory budget process, which uses the area rating capital budget. This is despite the fact that many of the measures funded this way were approved in the 2007 Transportation Master Plan or the 2001 Downtown Transportation Master Plan. Likewise, the City is already years behind its already unambitious schedule in implementing the Shifting Gears Cycling Master Plan, and some Councillors have even exercised vetoes to kill bike lane projects in their wards. We must also recall that Whitehead is the same councillor who argued strenuously against the transit lane and then accused staff of having an agenda when the staff report endorsed keeping and fixing the lane instead of scrapping it. All this happened despite the fact that he had already made up his mind a month before the report came out. He even commissioned a citywide survey loaded with leading questions, and then misrepresented the results when it came out that a majority of Hamiltonians supported keeping and fixing the lane. Whitehead was one of the nine councillors who voted to kill the lane, despite the evidence that it was effective and despite the fact that most Hamiltonians favoured keeping and fixing it. Like many of his Council colleagues, he also tried to frame his vote as support for a "comprehensive" approach to the city's transportation system. For his part, Whitehead maintains, "I am taking the time to listen and challenge ideas. Does not mean I am not getting something out of the discussion". Given that Whitehead is one of the 16 people who gets a final say on the City's transportation policy - including, crucially, the decision on whether a given recommendation is ever funded in the budget - we must hope that this time, he really is engaging the issue in good faith. Hamilton simply cannot afford the luxury of a myopic, parochial Council that keeps failing to make strategic policy decisions - and implement those decisions - based on clear understanding and good evidence of what is at stake. Hamilton has an amazing opportunity to repurpose its excess lane capacity, built during our industrial heyday, to create a rich, safe, high-quality active transportation network. But it shouldn't require a citizen movement with thousands of supporters to shame Council into approving a modest, inexpensive traffic calming design on a dangerous street with lane capacity to spare. One very helpful (but probably unintended) thing I learned from this article is that Herkimer and Charlton and Bay have apparently been downgraded from "minor arterial" to "collector" streets! and I have always described these streets as "minor arterials". The fact that these streets are now apparently classified as "collectors" (just one up from "local") means that we should be able to have much more aggressive traffic calming on them. In the 1990s, Locke Street South was also designated a minor arterial. It was on this basis that traffic staff refused to install a stop sign at Locke and Herkimer or Locke and Charlton. The ward councillor at the time (Terry Cooke) strong-armed them into installing a stop sign at Charlton and the earth didn't open to swallow the street up. After that, a stop sign went in at Herkimer and then all-day curbside parking was allowed. A few years later, a pedestrian-activated crosswalk was installed at Tuckett. More recently, the free curbside parking was replaced with metered parking. The rest is (recent) history: as Locke Street became progressively more pedestrian-friendly, the retail businesses recovered and the street is now a thriving urban commercial centre with a healthy, diverse mix of staple and upscale offerings. Vehicle traffic moves slowly and safely on Locke Street but there is nothing resembling "gridlock". Pedestrian and bicycle traffic is way up. At some point, Locke was also downgraded (I'm inclined to think of it as an upgrade) to a collector road - and this raises another important point: designation is not destiny. Just because a street was designated as a certain type in the past, that does not mean we are prevented from being able to choose a more inclusive set of uses for it. After all, the only rules we have to follow are the ones we collectively choose to make. What we need is Herkimer/Charlton lanes to be completed, and the Dundurn bike lanes to be upgraded to full protection all the way to York (Cannon style). Dundurn between Main-King is a big problem, until we figure out how it's arranged in the LRT future. The York lanes are the most underused lanes in the City; a very generous allotment to bikes but less use. also good news, Queen St is a minor arterial from Aberdeen to the waterfront. No need to keep treating this residential street like it's a highway. Also interesting to note, Fennell and Garth are minor arterials, although you won't find me wasting an ounce of energy trying to convince anyone to implement safe, complete streets in Ward 8.
complete streets in Ward 8." Because an eye for an eye always ends well. ??? No, It's a battle not worth fighting in that area. Tough enough to get safe streets in the parts of the city where residents and councillors WANT them. Why would I agonize myself trying to push them in a ward where the councillor wants to speed to and from work in 7 minutes? One strange thing about the road classification design guidelines is that even though both "collectors" and "minor arterials" are described as having the same 50-60 km/h posted speed limit, the minor arterials are supposed to be designed for 70 km/h and the collectors for 60 km/h. Apart from the fact that these design speeds are both significantly greater than the legal speed limit (up to 20 km/h greater), what is the justification for the higher design speed on the minor arterials? Are they actually trying to encourage speeding to increase traffic flow? And current thinking is that you design urban streets for the actual desired speeds (e.g. using traffic calming features like bump outs, chicanes, narrow lanes, speed humps etc.) rather than designing for speeds 20 km/h over the legal limit! Regardless of your opinion (whose side you are on), I want to say Kudos to Terry Whitehead for participating in an online discussion with local citizens! Terry has taken a photo out of his car (real safe) of traffic backed up because Queen Street Hill is closed. Gotta ask, why was it closed? Was it because of a crash? Because I see crashes at Queen and Aberdeen ALL THE TIME. Just a thought but maybe all those cars racing through the light to get onto Aberdeen isn't such a great idea after all. If Queen was two-way some of them could just go straight down Queen instead of everyone trying to hang a left and t-boning cars coming across when the advance green is over. Just a thought. it was during the wind storm last week. A huge tree fell and blocked the QSH for a few hours. Most of the day Aberdeen is a minor arterial (who chooses these names) but at rush hour (about 4 hours a day) it is a not a shortcut, it is heavily traveled and a mandatory route for thousands of people a day. There should not be and there is no need for parking on Aberdeen. The condition of the road is deplorable. Someone is going to get killed riding their bike along the edge of the road by the sidewalk. It is a danger to cyclists and pedestrians and a destroyer of cars. The road should be reconstructed. Bike lanes should be put in with divisions from traffic (this will protect pedestrians from splashes as will the new road surface.). Parking should be banned completely and the light at Dundurn should be a normal stoplight. It could probably be a "one and a half" lane road with one lane of traffic in each direction with right turn lanes at Locke, Dundurn, Queen, and Longwood westbound and a middle left turn lane the whole way down. Because it is a bus route, their also needs to be places for the buses to pull out of traffic so they are not blocking traffic to pick up and drop off passengers. During last year's Ward 1 Participatory Budget, a road diet on Aberdeen was one of the top vote-getters by ward residents. It was decided not to allocate funding to a proper road diet because it was likely to meet opposition (from outside of the ward). People who live near Aberdeen want it to be calmed, and there's little reason it couldn't be. I appreciate your bringing up the fact that, when any amount of rain falls, it's unlikely to be able to walk down Aberdeen without being splashed by a motorist. This probably seems like a pretty trivial complaint to anyone who mostly doesn't get around my foot. My walk down Aberdeen is to my job, and to me the fact that I can't get to my job without a car splashing my trousers is a failure of our transportation network in the same way a big pothole damaging a car's transmission might be to a motorist. Other cities have boulevards separating humans from live traffic. This isn't possible on every single street, but they don't put 1500 millimeter-wide sidewalks directly adjacent to streets that encourage fast-moving traffic. Not as often as Hamilton does, anyway. Your google map has to be wrong. I drive Garth, Beckett, Queen every weekday and I have to agree that there is a serious impediment to vehicular traffic...much more so than your GIF is showing. Also, some minor arterials are 4 lanes...like Fennel Avenue. So why can't Aberdeen? Also note that there are two major arterial roads (Beckett Drive, and Main Street/King Street) that don't connect. That sounds problematic to me. This is what happens when everyone just focuses on their own NIMBY situation. Also, some minor arterials are 4 lanes...like Fennel Avenue. So why can't Aberdeen? My point is that a minor arterial does not need to be four lanes. For example, Stone Church is a minor arterial and is only one lane in each direction with a centre turn lane - and it has painted bike lanes as well. Rymal Road is actually classified as a major arterial, but it's also one lane in each direction with a centre turn lane. Also unlike Aberdeen, these streets have wide grassy medians between the vehicle lanes and the sidewalks. So my question to you is: why is it that mountain residents get to enjoy minor and major arterial streets that are only one lane in each direction with protected sidewalks (and bike lanes on Stone Church), but residents living around Aberdeen have to suffer a street that is two lanes in each direction with unprotected sidewalks just inches from speeding vehicles and no cycling facility? Why is there such an egregious double standard in which the perceived convenience of motorists short-cutting through an urban neighbourhood takes precedence over the safety and quality of life for people actually living on and around the cut-through street? Again, I'm not suggesting eliminating Aberdeen as a minor arterial route for cut-through traffic. All I'm suggesting is that we design the street in such a way that the negative impacts of that cut-through traffic are mitigated for local residents. We know that a street that is one lane in each direction with a centre turn lane can comfortably carry up to 20,000 vehicles a day, which is considerably higher than the daily traffic on Aberdeen. So if we can make Aberdeen better for local residents without making it worse for cut-through commuters, where exactly is the knee-jerk opposition coming from? Yeah, I'll take google's data over self reporting from an entitled Hamilton driver who thinks it's okay to race down other people's streets so he can get home a minute faster, thanks. I.e. hitting a red light at rush hour is not a "serious impediment"
I'm still laughing at the guy who thinks having to stop at a red light is unfair and then calls people NIMBY because they don't want their street to be a death trap. OIOPY's think that street designs (or pollution levels) they would never tolerate on the street where they live are absolutely necessary on streets in distant neighbourhoods they drive through ... and that sometimes needing to drive through a neighbourhood should give them a veto of the residents who actually live there on what the neighbourhood should be like. The difference is that Fennel has grassy boulevards between the traffic and the pedestrians in most regions. Aberdeen lacks this feature. This means that high-speed through-traffic is directly next to pedestrians - that is unsafe and unpleasant. I'm not sure how Google calculates their map, and I agree that the map doesn't seem to show backups where I'd expect to see them, but I would assume Google's algorithm fixates on unexpected backups. A long wait at a left-turn is, presumably, expected, so we don't see the well-known backup of Northbound drivers attempting to turn West off Beckett Drive. Either way, if you think about the backups you see regularly when driving Aberdeen/Beckett/Queen/Garth, they generally occur at bottlenecks. Beckett Drive is noly 1 lane in each direction, is it's only natural that traffic would back up where 2 lanes become 1... so why do we need the 2 lanes in the first place? I think Ryan's design might be overconfident in cramming 5 lanes of traffic into what's currently 4 lanes, but his point is fair: if the traffic is fast going to Beckett, backs up getting onto becket, then backs up a second time turning left getting off of beckett before going fast again, doesn't that indicate that the fast regions are unnecessary? If it was all 1 lane, it would be smooth the whole way through and the locals could actually have guests park on the road or ride bikes or other zany things like that. Google uses crowdsourced data to generate traffic information. Millions of smartphones now create the worldwide traffic-congestion-information network. People using Google Maps as their GPS navigation, transmit how fast their car is going, and this is aggregated into traffic information. Plus, waiting for two light cycles during rush hour at one light along your route is not really chaos. No one said it was chaos. Just stupid and unnecessary. Why is it stupid and unnecessary for drivers to have to wait 2 light cycles during rush hour? Having the intersection empty with nothing moving through it has no legitimate purpose - i.e. is unnecessary. Stupid - because it is easily resolvable by using a normal traffic signal. Agreed. When using this route to get home, or visit friends who live in the area there, there are many, many times where this de-timed light serves no purpose. Same can be said about the de-timed light at Garth and Lime Ridge - it works during peak hours and is a massive nuisance for the rest of the day. I also have a great anecdote about someone I spoke to last night who told me that stop signs should all be removed, because they are annoying an unnecessary. I had to ask if he was serious because I've never heard such nonsense in my life. Strangely, this fellow was in favour of road diets and traffic calming measures. There are very, very few stop signs in The Netherlands. Priority is almost always controlled by yield signs. As far as I am aware, the number of four-way stop signs is precisely zero. And The Netherlands has the safest roads in the world. what's it sound like in your echo chamber? Apparently roundabouts are more efficient than 4 way stop intersections. But they do take up a whole lot more space. When my son was two years old, he stayed with a sitter on Garth st. She was a wonderful ECE, but she wouldn't take her gaggle of kids to the park or anywhere. Why? Because it would be irresponsibly dangerous to walk 5 kids along Garth Street. This is not a commercial or industrial road, people live there, just like Aberdeen, and it is grossly irresponsible to use these roads as somebody else's highway. Many cities have arterial roads that are 1 lane in each direction. That would be perfectly appropriate here. I'm a cyclist so I love bike lanes, but for this case I'm not actually fussy about what approach would be taken. I really don't care if the solution would be a permanent parking lane or a bi-directional cycle track or shoulder-style bike lanes or whatever. Let city staff pick whatever fits the best for the neighborhood. But fix this crap. Aberdeen does not need 4 live lanes. Garth does not either. Both of these encourage dangerously fast traffic a hair's-breadth away from families walking with young children. People need to look at the money involved in the situation. Things are not always what they seem. In my opinion, some of the resistance to reducing danger comes from the media, and the legal, police, insurance and medical industries. I could be wrong, but take a look at any of the 20 different law firms, promising large cash settlements to "accident victims" on prominent billboards, radio ads, and on the side of HSR buses. Do you think they want "accidents" to go away? Does anyone working in their offices? Do the insurance companies? The cops? The court officials? The hospital workers? EMS workers? The radio station? The newspaper. The HSR? None of these influential folks, and again, this is just my opinion, are likely to want collision frequency or severity to decrease. Why would they? An increase in safety means a decrease in business, for a lot of people. Yeah, and all those oncologists who couldn't survive without cancer. I think the insurance company is behind hurricanes, floods and tornadoes too. Crown attorneys cause crime. Its a known fact. As someone that lives on Aberdeen I don't think I ever enjoyed living there as much as when they closed the the Queen hill for repair. It was that experience that made me submit a traffic calming project along Aberdeen for Ward 1 Participatory Budget. Happy to see others thinking similar and very happy to see Ryan engaging the idea. And how many of those cars exited the 403 to cut across Aberdeen to access Beckett Dr.? You know there's something wrong with your street design when it draws cars off the highways on to city streets in order to make time. Why not stay on the highway and Linc to access south Hamilton. This is really the kernel of the argument. Why are drivers choosing Aberdeen to get to the highway from the mountain? I do it, because it's faster. If I go from Mac to my house on the mountain, (Mohawk/Garth Area) it's actually faster to take Sterling to King, King to Longwood, Longwood to Aberdeen, Aberdeen up the escarpment. My wife makes the same commute in the opposite direction and has found the Linc is faster. That's cool, I take the same route reversed in an out of work and it's faster for me. I leave around 8am and roll in anywhere from 815 to 820. Highway puts it around 8:20-8:30, longer if there's a collision anywhere along the 403. It is easier to get out of Toronto in the morning. The 403 at the Linc heading into Hamilton is bumper to bumper in the morning. your trip makes sense, especially if you live close to the escarpment. the ones Whitehead is suggesting deserve to control what happens in other neighbourhoods are the drivers headed to the GTA on the 403, and are choosing to use QSH/Aberdeen instead of the Linc or Mohawk Rd to get to the 403. Maybe they are not. Maybe they are trying to get to Longwood to get to mac - The largest employer in Hamilton. The 403 has an exit very close to Longwood without cutting through a residential neighbourhood. Are you saying that someone who lives at West fifth and fennel has to go up to the linc and around? What I'm saying is that anyone who wants to drive down Beckett Drive and along Aberdeen should be willing to do so at a safe and reasonable speed instead of the racetrack speeds we experience on the street today. I'm saying that someone walking along or across Aberdeen should not fear being maimed or killed by dangerously speeding vehicle traffic. I'm saying that we can continue to provide minor-arterial connectivity for through-traffic without sacrificing the safety and livability of local residents. Do you think that's an unreasonable request? DowntownInHamilton under a bunch of different screen names, stop being obtuse and just say it - all you care about is maximizing your own convenience, no matter how much harm is done to people in the communities you cut through and no matter how easy it would be to make the streets safer while still allowing you to drive through at a reasonable speed. I don't use sock puppets, why need to? I get enough love here under my own screen name. you care about is maximizing your own convenience, no matter how much harm is done to people in the communities you cut through and no matter how easy it would be to make the streets safer while still allowing you to drive through at a reasonable speed. No, I don't care about maximizing my own convenience, although I do benefit from what benefits the majority of people in our community - safe, efficient means of getting from A to B in a reasonable amount of time. Plenty of people commute in our city, and we're becoming more and more of a bedroom community. Having an inefficient means of getting people to where they need to go is not helpful, it's harmful. Having stated this many times before, I don't recall a time feeling unsafe walking along many of our major thoroughfares, like King, Main, James, Dundurn, John, and York - even if some of your more sensitive groups feel that way. Also, as stated before, better enforcement of rules already on the books is cheaper and easier than spending more money we don't have to help your vision of perceived fault with some of these things. If you want your pet projects to see the light of day, then attract business and grow your tax base. What do businesses want? They want things like easy access to their store/plant/warehouse/etc., they want land that's affordable, they want easy access to major roads and highways. Playing on the phony tugs of the heartstrings of "won't somebody think of the children/residents/community" to try and get your vision pushed through doesn't work with City Hall, EcDev, or the residents who don't work in the city but do reside, contribute and make up our city. Perhaps it's time you stop thinking about you and your vision for the city. Yes, yes, that's cute and all. What I find interesting is that the comments you post under your registered account are generally more civil than the comments you post anonymously. Your anonymous comments are short, rude, contemptuous and nakedly selfish; whereas your registered comments are longer, make some concession to conversational graces and at least pretend to a broader interest while still making the same self-serving arguments. It may be concern trolling, but at least it's somewhat polite concern trolling. The majority of people want traffic to move reasonably and calmy in their neighbourhoods. Unfortunately that makes each individual neighbourhood a minority in the overall scheme of things. The danger of Hamilton's streets is statistically so similar ot every other municipality in Ontario that the differences are irrelevant. Can you provide some analysis of the significance? What data are you looking at? In the 13 year period from 1998 to 2010, our motor vehicle collisions killed killed 61 pedestrians and injured 3,233. That's about 5 pedestrian deaths and 250 pedestrian injuries every year. The total number of deaths and injuries due to motor vehicle collisions per year is roughly 20 deaths and 2900 injuries. This means that about 25% of all deaths are pedestrians while only 9% of injuries are. This is pretty clear demonstration that pedestrians are vulnerable road users and the engineering of our streets needs to take this vulnerability into account as a limiting factor. Note that the number of deaths from motor vehicle collisions is roughly twice the number of homicides ... and we take homicides pretty seriously! These statistics are very far from the "Vision Zero" that more progressive municipalities have as their goal for road safety. I don't know what this anonymous guy is talking about, but 5 deaths per year in a population of 520,000 is less than a 1 in a 100,000 chance of being killed. A 2010 study found that 139 pedestrians are killed every year in Ontario. That works out to about 1/100,000. 5 (or 1/100,000) is a statistically insignificant number. What I take him to mean is that if the Ontario average was .8 as opposed to 1 in Hamilton, that .2 is an even more statistically insignificant number. That would be about 1 person a year. But in fact the number is lower such that it is not even a whole person. That does not mean that 5 deaths is acceptable at all. None are. Drivers and pedestrians have to be more careful. But the logical conclusion that everyone should drive at 30 km an hour does not necessarily follow. You have to weigh whether or not the result you are trying to achieve will be accomplished while weighing the cost involved. So the extreme answer is, if no one drives, no one is killed. But then you don't have the benefits of a post industrial society. I think the answer will lie in driver-less cars and buses in the long term. Testing for driverless cars will begin in Ontario this January. The future is coming faster than we think! The risk, of course, includes both death and injury over the entire lifetime of a resident: you need to compare the correct statistics since you are citing risk of death from diseases. If you include both deaths and injuries and assume a lifespan of 80 years, you find that the average Hamiltonian has a roughly 4% risk of being killed or injured as a pedestrian. The overall lifetime risk for a Hamiltonian to be killed or injured by a motor vehicle is about 37%: extremely significant! And note that unlike many diseases, death or injury by motor vehicle is far more preventable. The point of the "Vision Zero" reference is that, even without self-driving cars there are a lot of things that can be done to reduce deaths and injuries. And the 30km/h limit is not some arbitrary number: it is the upper bound for survivability of a pedestrian. It also decreases the likelihood of collisions in the first place by allowing more reaction time (and shorter stopping distances). The 30 km/h limit (combined with the fact that people just aren't careful all the time) does in fact logically follow from the goal of reducing (if not eliminating) pedestrian deaths and injuries. It would also reduce motorist deaths and injuries. Since urban driving involves a lot of stopping and starting averages speeds are in any case far lower than 50 km/h. So lowering the maximum speed to 30 km/h doesn't make a huge difference in most journeys, especially if major arterials remain at 50 km/h. There is no logical reason for the 50km/h limit in urban areas ... it is just traditional. And that tradition is being challenged in many places in Europe and North America, most recently in Toronto which has reduced the speed limit to 30 on all local residential streets in the downtown area. Over 100,000 people died in Ontario last year. 138 of them were pedestrians killed in car accidents. That is close to 1 in a 100,000 chance that in any given year you are going to be killed as a pedestrian. If you live 80 years, your chances are the same each year. Where do you get 37% chance of being injured or killed in your lifetime? I'm sorry, but you do not understand basic statistics. If I told you your risk of dying of heart disease is only 2% per year, but your lifetime risk of dying of heart disease is 80% would you brush this off as negligible because the risk each year is low? These calculations are basic statistics. To get the 37% you consider 80 trials in each of which your chance of not being injured is 1-3000/520000. Thus, the chance of not being injured over your lifetime is (1-3000/520000)^80, or 63%. Since there are only two outcomes (you are either injured or you are not injured), your chance of being injured is 100-63% = 37%. And don't forget that there is a big difference between completely preventable (in principle) premature deaths (like being killed by a car) and death by disease or physical debilitation in old age. Everyone dies eventually, and the majority of those 100,000 deaths are not what Statistics Canada would call "premature" (younger than 75) and about 2/3 are for those 70 and older. The peak age for deaths in Canada is now 85. And, most importantly, people care not just about deaths, but about being injured (especially severe injuries). With 3000 injuries per year in Hamilton alone, motor vehicles are a very big risk. You guys are talking apples and oranges allover the place. 5 deaths for pedestrians is not really relevant to 3,000 automobile injuries. Compare the same things for heaven's sake. One of you is talking about rates and the other about overall lifetime risks. The point here was about pedestrian risks. (1-5/520,000)^80 is .992% meaning you have less than 1% chance of being killed in your lifetime as a pedestrian in Hamilton. So you have a 1% lifetime chance of being killed and 3.8% chance of being injured as a pedestrian. The statistics guys point was 0x0=0 I took that as meaning that differences between Hamilton and other municipalities is statistically insignificant. If its 5/520000 in Hamilton and 2/100,000 in wherever, the differences are negligible. The basic point you and Charles Ball are trying to make is that the risk posed by motor vehicles is negligible and that therefore any differences between cities is also negligible. And, by implication, that we shouldn't worry about it (why else make the point?). It is this claim that I am arguing against. A 4% lifetime risk of being injured (or killed) as a pedestrian is a non-negligible risk. A 37% lifetime risk of being injured by a motor vehicle is huge (you talked about "danger" not just death)! And 3000 injuries per year is an astounding number from just one source. The lifetime risk for females for dying of breast cancer is 2.72%, but we still take it very seriously and spend a lot of money and effort to reduce it. And, unlike other sources of injury and death, we have proven strategies based on simple engineering and physical and psychological principles for dramatically reducing the number and rate of injuries: design urban streets for speeds no higher than 30 km/h rather than the 60-70 km/h design speeds we have now. And these design changes reduce injuries and deaths for all road users, not just pedestrians. I was saying that the fact that Hamilton has a higher death rate for pedestrians than other municipalities is not statistically significant. Cars are the single highest cause of serious injury and death in people between the ages 18 and 30. No questions from me about that. However, Hamilton's streets are not really any more dangerous than any other major metropolis in Ontario by any significant statistical standard. And I will stop nattering because this is a tempest in a teapot. The pedestrian injury rate in Hamilton is at least 35% higher than the Ontario average (and 45-81% higher for cyclists). That is a huge difference! To put this in concrete terms, if Hamilton had at least an average pedestrian injury rate (not even lowest) we would have 65 fewer injured pedestrians each and every year. This is not negligible. Isn't it worth trying to improve Hamilton's streets to save 65 fewer pedestrian injuries, especially if it saves motorist and cyclist injuries into the bargain? Even considering pedestrian fatalities alone (which is less statistically significant than injuries since the numbers are much lower), although Hamilton's rate is similar to London and less than Windsor, it is still about twice as high as Toronto and more than twice as high as Ottawa. If we had Ottawa's rate then we could expect 2-3 fewer pedestrian deaths each and every year. I think you are looking at the green line in the Hamilton report (the commuting numbers) and not the real numbers or the red numbers in the graph. In 2011 there were 7 pedestrian road deaths in Ottawa. http://ottawa.ca/en/2011-ottawa-road-saf... Their population was about 880,000. So Hamilton is 6/520000 or just over 1.15 per 100000. Ottawa is 7/880000 or just .79 per 100000. You could say that Hamilton’s rate is 1.45 times the size of Ottawa’s rate or even more dramatically that Ottawa’s rate is only 68.6% of that of Hamilton’s or even more dramatically still that Hamilton’s rate is 45% greater than Ottawa’s. But what does that mean? In real numbers, out of 520,000 people living and walking in Hamilton, 6 died in car accidents. Out of 880,000 people in Ottawa, 7 died in car accidents. These are not large numbers. 138 people out of 13.7 million people die in Ontario as pedestrians in accidents with cars every year. That is 1 out of 100,000. Given all the numbers in real, not percentage terms, Hamilton is just slightly over and Ottawa is just slightly under the provincial average rate per 100000. If Hamilton had one less death and Ottawa had one more death Hamilton would be under the provincial average and Ottawa would be almost at the provincial average and their two numbers would be the same on a per 100000 basis (.96 and .9 respectively.) When you are talking about such small numbers, there is nothing of statistical significance to be gleaned by talking in terms of percentages. The real numbers are just too small. In any given year they will likely vary by too great an amount to draw any meaningful conclusions from them other than that some years are more dangerous than others. In fact, just choosing per hundred thousandths and putting them into one year slots does not help much. On the injury side, it is impossible to gauge the true societal significance of the rate because we do not know the degree to which the pedestrians were injured. Simply saying that any number of people would not be injured doesn’t help us understand the immensity of the problem. We do know historically, looking at accident and death rates since the invention of the automobile, that overall, over time, the danger has been decreasing until it has nearly plateaued and the safety has been increasing until it has nearly plateaued. it really gets annoying to hear the pea-brained stuff from Ward 8 trying to make it sound like residents below the escarpment are proposing a Berlin Wall at Aberdeen and they'll no longer have access to it. They'll have the same level of access they have today, just without the ability to risk lives passing at 70k in the curb lane. Although the more I hear from that ward, the more appealing a Berlin wall sounds. Don't need people with zero regard for other human lives racing through our neighbourhoods. I don't live in Ward 8 and I made a suggestion for a solution above, but at the end of the day we all live in this City. If you lived in Ward Eight (which is not a suburb) and worked at Mac, you would not want to sit for three light changes a Dundurn and three light changes at Longwood and Main and then again at Columbia college and then again at Dalewood. You just want to get to work. It wouldn't be because you have "pea brain." There is no viable bus route, no mass transit at all for that matter, and all you want to do is maximize the time you are with your family and minimize the time you spend in your car. Mac has been out in Westdale for nearly 100 years now and the routes - Mohawk, Fennell, Beckkett Drive, Aberdeen, Longwood and Main were there long before most of the people who live near Aberdeen now were even born. There used to be an army tank manufacturer down on Aberdeen and Westinghouse and Camco. Presently Mac is one of the last major employers in Hamilton and it is not fair to call people who work there "pea brained" because they want to enjoy life as much as you do. Some people will drive up Chedoke at 70k. Most people don't. Most people on Aberdeen during rush hour (not at other hours when they do speed) don't speed because they cant speed. Fix the Road. Enforce the law. Don't insult people just because of where they live. Come on. Jason is not calling people "pea-brained" for wanting to drive on Aberdeen at a reasonable speed. He's saying it's ridiculous to claim that converting Aberdeen to a safer three-lane minor arterial will somehow create unreasonable delays for cut-through drivers. none of us will be alive if Hamilton ever grows to the point of someone encountering 4 different intersections where they sit through 3 or more green light sequences without getting through the intersection. Aside from blizzards or a street being completely shut down, I don't ever remember having that happen once in my entire life in Hamilton, let alone 4 times on one trip. Their commute to Mac will work just like it does now if Aberdeen is 3 lanes instead of 4. If it's good enough for suburban main streets like King or Wilson, it's good enough for the slummy lower city. just one day, so take it with a grain of salt, but I left City Hall today at 5:30. Was at Garth and Fennell by 5:35 and Garth at the Linc at 5:37. I was expecting a 10-15 minute drive at that time of day (which would be an insanely easy, quick commute in a city). Nope. 7 minutes. Am I crazy in thinking that shouldn't even be possible? Using the #35 College bus from James and Hunter to Garth and Garrow we get a trip time of 22 minutes. Although I imagine it's a few minutes longer during rush hour as it becomes crush-loaded between downtown and Mohawk College. Add some walking time at the start and end of the trip, and it's easily a 30 minute commute. The only reason a city councillor should be posting pictures of 8 single-occupant cars waiting to turn left is if there is a bus with 75 people being held up by the 8. With the LRT taking a dedicated lane, and full traffic priority, fast all-door boarding (8 doors simultaneously! When we're using 2-vehicle peak-hour consists -- a chain of LRT vehicles, Calgary C-Train style -- for subway-style feel). I'd imagine ann A-Line LRT could get you from City Hall to the LINC area in under 10 minutes (via Upper James) at typical LRT operation speed. The straight tunnel ramp would be faster than a curvy ramp like Jolley Cut -- about a 6-to-7-degree tunnel ramp slope to get from Lower/Upper. LRTs average 27kph when including the stopping delays, almost twice as fast as a bus. Not bad at all. If the LRT is configured properly, with proper traffic priority, it can be nearly as fast as driving. According to the above posts you should have driven down king to the 403 up to ancaster down the linc and back down garth. After all the time you wasted and the pollution you casused, you then take off your hair shirt and start self flagellation. That trip is not what the above posts were advocating for. I commute to Toronto twice a week for work. To get home I always exit the 403 at Aberdeen and then go left at Locke to get home. So I essentially 'go around the back'. The reasons I don't get off at Main are first that it is really hard to cross Main to get to Dundurn from that off ramp and second, Dundurn between 4 and 6 is like a PARKING LOT if you're going South. What do I see looking way down the line of cars? Virtually everyone signaling left onto Aberdeen. And you know where they're going - up Beckett Drive... Who are all these people?? The only ones who should really be using that would be living in the area bounded by Mohawk/the Escarpment/ W5 and Sanatorium but even then is sitting for 15 minutes on Dundurn worth it? The 403 was moving fine. Take it up the mountain, get off at the Linc and then Mohawk / Garth. No way do I want to see it being made easier for more cars to use this area. Make it harder and get those folks using the highway. When 220 Dundurn is done and we have couple hundred more neighbours Dundurn will be impassable at rush hour. GOOD. Those would be the cars that didn't impatiently cut down one way Homewood (or insert name of other eastbound one way street in the PM or westbound in the AM)to get to Locke (or whatever street)to avoid the traffic on Dundurn (or other minor arterial). Why on earth are all of these streets one-way? They only encourage speeding cut through traffic. Stanley, Homewood, Herkimer, Charlton, Herkimer, MacDonald, Hawthorne etc. etc. What possible good reason is there for this ridiculous set up that no other neighbourhood in the city has had it inflicted on them. It is total BS and there is no sound argument for not undoing it all. NOW. And of course it must be pointed out that the total cost to convert all these streets back to two-way is a drop in the bucket compared to the average suburban road project. I have have to call you on this. We already spent tens of millions of dollars repairing the the king and main 403 overpasses. Converting those two overpasses to two way would costs tens of millions of dollars. That alone would be an above average suburban road project. Further, overbuilt suburban road projects are a completely different issue. While Councillors' concentration on waste is rebutted by the suburban road project point, it does not justify the tens of millions of dollars it would cost to convert King and main to two way. It seems to me that the exits to Main Street will be quite easy and inexpensive to adjust so that they meet Main Street at a more perpendicular angle. From there it's a matter of adding intersection controls - probably traffic signals, at least on the exit from Hwy 403 westbound - and painting a yellow line down Main Street. King Street is more challenging. The exit onto Hwy 403 eastbound doesn't need to change, but the exit onto Hwy 403 westbound is designed on the assumption of westbound King Street traffic in the far left lane. It may be possible to add traffic signals there to give a left turn option to westbound vehicles on King (I'll leave that determination to the engineers), but it seems clear that eastbound vehicles on King would not be able to access either highway exit. Of course, it's not currently possible to access the highway from King if you're driving eastbound, so at worst this will be no worse for driving connectivity than the current setup, which doesn't allow drivers to access anything eastbound on King. It may be that Main can be converted to two-way easily whereas King cannot. As far as I'm concerned, one out of two would still be much better than nothing. if main was two way and had full highway access maybe king wouldn't need ramps at all. It's also technically possible to do both Main/King 2-way until Dundurn, and keep either or both Main/King 1-way west of Dundurn. "...identical to every. single. red hill ramp". Or identical to every other exit ramp on a 400 Series highway in the province. We haven't stumbled on to magic in Hamilton. We are a 1960's era traffic sewer stuck in time while the world passes us by. At least some of the ramps could be adjusted for a perpendicular intersection. The big expense of the work was rebuilding the bridge itself, not the ramps at its enpoints. As for the two-way conversion, yellow paint is cheap. Yet another way in which our mammoth one-way thoroughfares are great for short-cutting across the lower city but bad for trying to reach a micro-destination within the lower city. If Main was a normal two-way street and the Hwy 403 off-ramp was a normal signalized intersection like most highway exits, you would only have to navigate across one or two lanes of traffic to get into the right-turn lane onto Dundurn instead of five freaking lanes. My limited experience driving on Dundurn is different than yours- besides the occasional slowdown on Dundurn South for left-turners, it proceeds quickly at pretty much all hours as far as I can tell. It's unpleasant by bicycle because the lanes are inadequate, and unpleasant on foot because a)the sidewalks are not buffered from traffic by anything most of the way; and b)there are plenty of conflict points with impatient drivers. Many of these were specifically identified as issues by residents in the Kirkendall Traffic Management studies- drivers failing to observe the stop sign at Charlton before zooming onto Dundurn; drivers being impatient at the LCBO and Beer Store parking lots. I think your observation that much of the traffic on Dundurn is bound for Aberdeen and Beckett Drive is correct. In the morning, the reverse is true, and traffic comes all the way down Charlton to use Dundurn to proceed to the west end. You're also right that Dundurn needs to be made more difficult for cut-through-traffic to use. I understand it can't be given the same treatment as Locke, but there should be some crossing in the 700 meter gap between the lights at Herkimer and those at Main. You're right: the highway is right there. Cars should be using it, except for a very few residents near the edge of the mountain for whom Aberdeen and Beckett actually make logical sense. This whole "debate" with Terry Whitehead just further compounds my bad attitude in general about Hamilton. This guy can barely string a coherent sentence together, shakes his head at logical arguments presented to him and then talks in a circle once he's obviously been proven wrong. He is everything wrong about politicians and yet he still gets voted in every election by a significant, depressing margin. So no only is this incompetent a councillor in Hamilton, but he also backed by a large portion of his ward who must also share his gaps in reason, logic and cognitive ability. How does Hamilton ever move forward with the likes of Terry Whitehead getting in the way? The primary goal of every politician is re-election. If his constituents want status quo on Aberdeen, throw any logic out the window, Whitehead will fight for that status quo. Sadly I think Clr Whitehead is a master of just that. Don't say too much, don't say too little. Don't scare anyone with weird changy ideas. Works like a charm. I don't think he holds a monopoly on that. It's pretty bad when Edmonton is taking us to school on road safety. I have never feared for my life as much as I did riding a bike through that city. And the evening rush exiting the 403 at Aberdeen to the access? That's what the Linc is for. Worthy of note is what happens to Aberdeen when it passes through the Durand mansion district. Seems that the ultra-rich rather like traffic calming and don't like cut-through rat-running car drivers on the street in front of their mansions. Aberdeen between Queen and James streets is traffic calmed and is not a through street for car drivers. The wealthy people who live there used their political clout to make it that way. As a somewhat non-wealthy person, I want the same traffic safety measures for my children as the rich people successfully got for their children. This means "yes" to traffic calming and "no" to cut-through rat-running car drivers. There are bump-outs, but it's still 1-way with no stop-signs. You can see the compromise that happened - they added traffic calming, but still designed it for through-traffic as a 1-way so that drivers can get to Bay, the pair of Queen. How many drivers do you think realize that there's a high-speed connection going north? Not many. Basically a ninja-backdoor they left for people working at City Hall and St. Joe's. Two way Queen = Garth to Beckett to Queen to King to Mac. Not with LRT on King. No way. No room. Well by then you'll have two way Main. King opens up to 5 lanes at Locke. With LRT, that becomes 3, so still more (plus synched lights) than current Aberdeen. Clearly you are not a plumber. The bottleneck between Queen and Locke will block the traffic. When you close off a pipe it reduces the flow. It doesn't matter how open it is after the blockage. If it becomes a serious problem, the city could prohibit left-turns through to Locke. This means there's at least 1 lane of completely uninterrupted traffic (where we currently have 2, since the other lanes face pauses from stopped buses and turning movements). Also, hopefully 2-way Main will mean the 1-king will become the 1-main instead of splitting accross two streets, which would also help keep the remaining lanes of King running smoothly. Clearly you are not an engineer. Roads are not pipes, people are not droplets of water, and fluid running through a pipe is not a useful metaphor for how traffic systems actually work. Are you saying that by eliminating 2 lanes of traffic between Queen and Locke on King, making the LRT a right of way such that traffic must stop for it as it lets people off in the middle of the road and adding the traffic from Aberdeen, that there are going to be no problems? Where did you get your engineering degree? The LRT is planned to run curbside: cars won't have to stop. You seem to be thinking of Toronto's streetcars. Yes: there will be big changes, one of which is that a lot more people will be taking public transit instead of driving. And a lot more people will be living downtown and along the route. Both of which will decrease car traffic along those corridors. In its 2010 BCA Metrolinx also proposed converting Main to 2-way in order to give drivers more Westbound options other than King. And Steer Davies Gleaves (the consulting engineers) did do a lot of traffic modelling to make sure it would all work. A whole lot of things will change, and Aberdeen and other streets will likely be reconfigured. Now that I think about it, you didn't say that there wouldn't be problems, you only said that the analogy is incorrect. Well, if the analogy is incorrect, is the conclusion incorrect? So I went out this morning and measured the width of Aberdeen between Queen and Locke, using the highly scientific measuring device of how many Ryan-shoes it is in width. My shoes are around 13 inches long, and the street was just over 44.5 Ryan-shoes in width, giving it a total width of 578.5 inches, or 48 feet. Converted to metric, that gives us 14.6 metres to work with, not including sidewalks. If we include the two 1.5 metre sidewalks, we get a total ROW of 17.6 metres. Streetmix thinks 1.5 metres is too narrow for a sidewalk and I'm inclined to agree, but the sidewalks will both be physically protected from moving vehicle traffic and this design means the city doesn't have to rebuild them. Streetmix also thinks the bike lanes are too narrow, but 1.4 metres is the width of the Cannon Cycle Track lanes west of Victoria, and they seem to work just fine. I'd also like to see a westbound contraflow bike lane added on the one-way eastbound section of Aberdeen past Queen, at least as far as Hess. That will allow cyclists to connect between Aberdeen and Markland, which is one-way westbound and has an eastbound contraflow bike lane. Ideally, I'd also like to see bike lanes on Queen to connect with the Herkimer and Charlton bike lanes, but baby steps. And of course I still want to see Queen converted to two-way to alleviate both left-turning pressure at Aberdeen/Queen and rat-running on the other local residential streets. 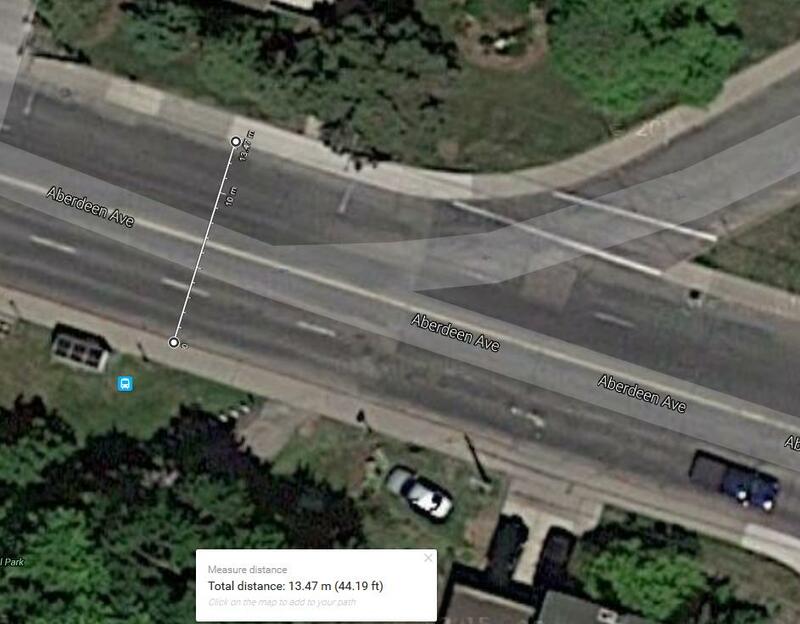 Edit to add - I'll have to measure the street west of Dundurn to see how this kind of arrangement would fit around the CP rail overpass between Studholme and Longwood. Obviously it would be great for the bike lanes to connect with Studholme, which gets you to the rail trail across Hwy 403, and to the off-street multi-use path on Longwood, which is supposed to be extended eventually to connect to Main and the bike lanes on Longwood north of Main. Google maps thinks it's closer to 44 feet at Queen. Obviously, though, at this zoom I have no idea how exact their scale is. even at 44 feet Ryan's cross section will fit no probs. Centre turning lanes can be a couple feet narrower than full driving lanes. I would make the sidewalks wider or put the bike lanes on either side of the road. I did consider that, but putting them together means we can physically protect them, and it also means the westbound lane won't be in the "door zone" of the parked cars. Also expropriate any land necessary to continue this model all the way to Longwood. fantastic. I'm surprised it's that wide. Was figuring it would be around 44 feet. FYI, centre turning lanes never need to be a full lane width. I realize in Hamilton we overbuild them all the time, but common practice is more like 2.5 - 2.7 metres for centre turning lanes. Normally I prefer bike lanes to flow on the same side as traffic on a two-way street, but in this case it probably makes sense to keep the bike lanes on one side so they can be protected. Don't think there's enough space to protect them properly on each side. no clue who you're talking too here (not that it matters) but I've driven daily on Beckett for 15 years. One time it was slow in a massive blizzard a few years ago. I also drive down Markland turning left at Queen frequently. I have lived there 21 years. When I walk home at night, Queen is stop and go from Aberdeen to Herkimer at the very least and sometimes all the way to Charlton. This is daily and sometimes it is worse like a couple of weeks ago when the traffic was blocked by some construction. If you try to turn left from Markland on to Queen you need a kind soul to let you get over which usually happens because the cars are stopped for significant periods of time. I have never seen the traffic move southbound freely at that time of day. Traffic from Aberdeen Eastbound turning on to Queen is better. Mornings are busy such that Queen Northbound is always backed up to Beckett. Jason is correct from what I can see that Beckett is always moving save and except 403 closure days and when there is construction or an accident. But that is irrelevant because you end up stopped at Queen if you are going Westbound. Beckett moves way better than the James street hill which is a disaster ever since they changed the traffic patterns around St Joe's. It is a route to be avoided at almost all costs and may be a reason why people go down Beckett and across Herkimer through Durand. Maybe you guys are talking apples and oranges or maybe one of you is being disingenuous. Beckett Drive itself moves just fine except for the back-up at the left-turn where it meets Aberdeen. Making Queen two-way would actually help the traffic coming off Beckett Drive, because then you'd have more cars going straight through instead of all being forced to turn left. Also, having live traffic lanes on Aberdeen wouldn't change this left-turn business, because the left-turn is already only 1 lane. That lane would not be subtracted, so nothing changes there. In short, calming traffic on Aberdeen would not have impact on Beckett Drive, and making Queen 2-way would likely make it better.